It’s summer and you know what that means? Time to break out the sandals and take care of those crunked footies. Recently, our Editor-in-Chief’s husband came across a group of Mexicans in the mountains of the Sierra Madre that made huaraches (sandals) out of recycled tires. They also ran about 100 miles in them. So, we thought we’d show our loyal Jaunt Magazine readers another off-the-hook idea for those travelin’ twinklin’ toesies. First of all, we thought the name was fun. Second of all, they’re hand-made in Cambodia from old tires. The sandals are snug and comfortable, making great footwear for going to the beach or backcountry travel. 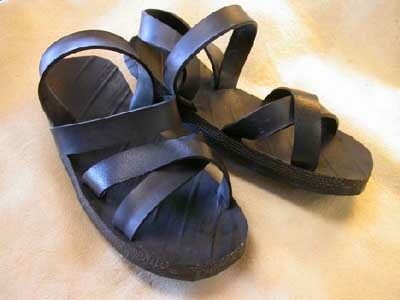 Rubber tire sandals were used extensively by the Viet Minh and Viet Cong during the war in Vietnam from the late 1940’s until the fall of Saigon in 1979. In the face of equipment shortages the guerilla army of Vietnam turned to using old truck tires as footwear and quickly saw the advantages of the resulting sandals compared to boots. The climate of jungle-Southeast Asia is harsh. During the war many American infantrymen suffered from “trench-foot” or fungal infections (yikes!) which resulted from wearing boots in the humid climate. Many looked with envy to the sandals worn by the enemy. Tragically, this footwear is also widely associated with the genocidal Khmer Rouge regime which ruled Cambodia from 1975 to 1979. Only the upper cadre of the Khmer Rouge wore these sandals and it was a sign of political power within the regime. They were seen as a good example of self-sufficiency and were very practical. The sandals also have many benefits; they’re easy to clean, they stay snugly on your feet, they’re comfortable and they dry quickly. Old Ho’s Rubber Tire Sandals are incredibly durable, as well, and it’s unlikely that you will damage the soles during normal use. They are, after all, made of truck tires! There is a possibility that the straps may loose elasticity after rugged use, but they’ll tell you how to replace them. Piece ‘a cake. HeritageWatch is an international Non-Governmental Organisation dedicated to reducing the destruction of cultural heritage in Southeast Asia. The organisation is involved in a number of activities that are designed to raise awareness of the importance of cultural heritage and reduce the occurrence of looting. Granny’s Country Store purchases the sandals through Heritage Watch, helping to benefit their programs. $30/pair. Since they’re unable to restock on the larger sizes, they’re closing out the remaining stock of small sandals. Feel free to send them back for a bigger or smaller size if the first pair doesn’t fit right, but get ’em while it’s still summer. This entry was posted in cambodia travel, style and tagged cambodia travel, style. Bookmark the permalink. of the remarks on Cambodian Recycled Tire Sandals | JAUNT MAGAZINE.